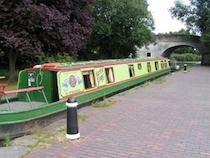 The Ginger8 class canal boats. There is full radiator central heating on the boat. A water tank supplies the hot and cold running water. It has carpeting throughout. Unusual design with 4 cabins so no need to make up beds in the saloon. Radio/CD player, colour TV/DVD player. Hairdryer. 2 wet/shower rooms with toilet and sink and shower in each. Electric Razor point.